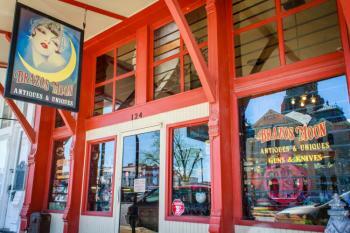 Today, Cherry Hanneman from Brazos Moon Antiques & Uniques is guest blogging here at Visit Granbury. Shopping is even more fun when you hope to find something no one else has. 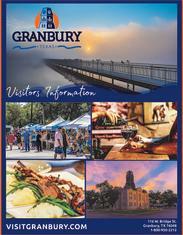 There are so many fabulous shopping options in Granbury, and you can find a complete list of downtown shopping here. 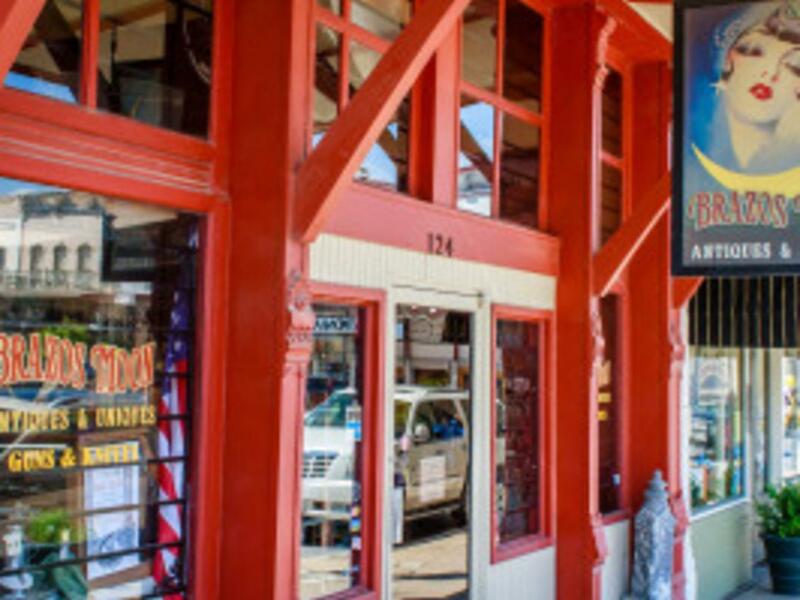 The thrill of finding a spectacular and unique treasure is what keeps people coming back again and again to Brazos Moon Antiques & Uniques. 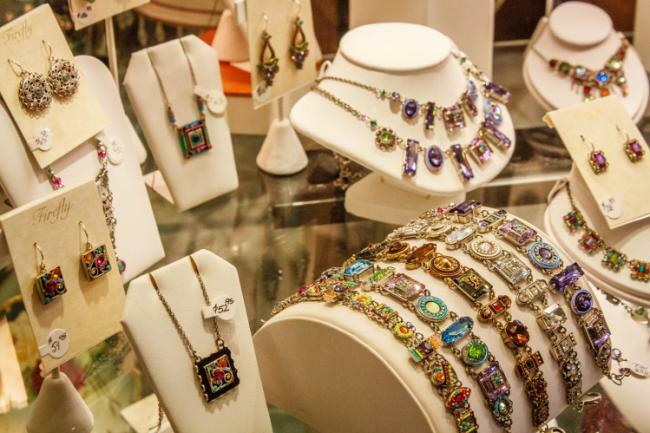 Between the old tractor grills and the Victorian jewelry, the new J. Devlin Art Glass picture frames and the exclusive Firefly jewelry from Guatamala; Brazos Moon has something to capture the interest of just about everyone. In our “Man Corner”, you’ll find a wide variety of vintage firearms, as well as two lines of new handguns (Bond Arms and STI). In addition to that, you’ll find such things as vintage poker caddies, Trench Art pieces, old and new knives, a ship’s telegraph, a Winchester Bullet Board, and vintage swords. If you want to decorate your home in the “farm house” style popularized by the HGTV show Fixer Upper, we can provide everything from furniture to firkens. If your tastes lean more toward Art Deco or Art Nouveau, we have such things as vintage prints, bronze bookends and beautiful candlesticks. And if your preferences are more formal, we can provide you with beautiful cut crystal, Victorian mantel lusters, cranberry pickle castors, and even a Victorian condensed milk caddy (bet you haven’t seen one of those!). We are located in a building first occupied by Granbury merchant Jefferson Davis Brown in 1898. If you stand across the street in the courthouse parking lot, you can still read the letters J. D. Brown carved in the limestone above the awning. We’ve been in business for almost 11 years, and many of our customers tell us that we are a primary reason for their trip to Granbury. They enjoy the ever-changing variety of items from “elegant to eclectic” they find in our shop. We are fortunate to have close to a dozen dealers who share our desire to provide a quality shopping experience for our visitors. Our selections also make fabulous gifts. Mother’s Day and Father’s Day are right around the corner, and vintage gifts can bring a touch of nostalgia and love. Stop by, we are always happy to provide gift suggestions! Grab a meal after you shop, there is a complete list of options here. And if you can stay the night, find a delightful B&B or hotel here. You will be so glad you visited! We cannot wait to have you.